) Family-Driven and Youth-Guided, with the strengths and needs of the child and family determining the types and mix of services and supports provided.
) Community-Based, with the locus of services as well as system management resting within a supportive, adaptive infrastructure of structures, processes, and relationships at the community level.
) 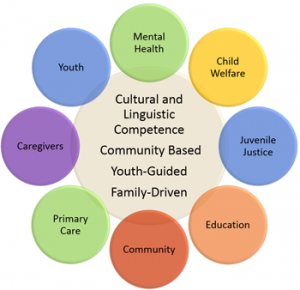 Culturally and Linguistically Responsive, with agencies, programs, and services that reflect the cultural, racial, ethnic, and linguistic differences of the populations they serve.
) Commit to evidence-informed and promising practices, as well as practice-based evidence.
) Deliver services and supports within the least restrictive, most normative environments.
) Ensure that families and youth are full partners in all aspects of the planning and delivery.
) Provide care management and care coordination (i.e.Wraparound) at the practice level.
) Provide services to families and youth in their homes and community or community-like settings.
) Provide services for transitionof youth (age 14-18) to adulthood and to the adult service system as needed.
) Emphasize prevention, and early identification to improve outcomes.
) Focus on quality and improvement by adhering to the systems of care goals; practice fidelity, and outcomes at the system level, practice level, and child and family team level.
) Protect the rights of children and families and promote effective advocacy efforts.
) Ensure that services are sensitive and responsive to differences.